My earliest memory involves food. I’m not entirely sure whether I am remembering the actual event or whether it’s been incorporated into my memories via family stories but either way it has stuck. I was a toddler I think and we were camping up the coast from Durban somewhere, probably at Mtunzini. I had a Strawberry Swirl gripped in my excited little paw. Strawberry Swirls will be known by many names but they are those shortbread biscuits with a lovely jammy centre. I was about to start nibbling all the biscuit off so that I would be left with the jammy middle bit to savour last, when a little hairy grey arm shot out of the bush next to me and swiped it. The thief turned out to be a Vervet Monkey which looking back is quite amusing but at the time I was absolutely devastated. I’m sure my parents must have given me another biscuit to replace the one that was thieved but it has always stayed in my mind, and I think its made me very protective of my food! Each part of my life is marked by these memories of food, either stories involving food or just specific meals which take me back to a certain time and place. I can remember sitting on the kitchen counter when I was little while my mom was baking bread and being given little lumps of raw bread dough. They were sort of chewy and lovely and salty. I remember sitting on the deck outside the kitchen and eating avocado pears, just cut in half and sprinkled with black pepper and apple cider vinegar. If you make cuts in the flesh with a knife then the vinegar soaks into the flesh and you get it’s zingy flavour all the way through. You can scoop the flesh out and spread it on toast if you wish but I just eat it straight out of the skin with a teaspoon. I still eat them like this all the time, although the avocados you get here in Scotland are nothing like the huge, buttery, ripe ones you get in South Africa. I remember stopping at the local shop on the way home from school with my mom and my sisters and buying cheese topped rolls and milk tarts. We’d go home, butter the rolls with mayonnaise and cram them full with crisps to make a crisp butty, one of the most unhealthy, and yet most satisfying afternoon snacks. Then we’d have milk tart for pudding. Milk tart is a South African type of custard tart which consists mostly of milk and cinnamon with a shortcrust pastry base. Its the first thing that pops into my head if someone asks me for a traditional South African recipe so it seems only fitting that it be the first recipe on this site. 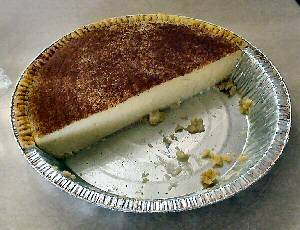 I had tried several different recipes and this the easiest and the only one that makes a milk tart like the ones I remember. Preheat the oven to about 180 degrees. Line a tart dish with the short crust pastry and prick the base with a fork. Line it with greaseproof paper and baking beans (I use dried beans or rice) and blind bake for about 10-15min. Remove the baking beans and bake for another 10min or until it starts to brown slightly. Set aside to cool a bit. Heat the milk in a saucepan with the cinnamon stick to just under boiling point. Lightly beat the eggs and sugar together, then add the flour, corn flour and 1/2 tsp of cinnamon. Pour the hot milk slowly into this mixture, stirring rapidly. Return the saucepan to a low heat and continue to cook, stirring constantly until the mixture becomes very thick. Keep stirring/whisking to stop it forming lumps (you do have to keep stirring constantly). Take off the heat, remove the cinnamon stick and stir in the vanilla essence and the butter until melted. Pour into the pastry base and sprinkle with the rest of the cinnamon. Let it cool slightly and and then cover and keep in the fridge until it’s set. It will keep in the fridge for a few days.